What are implants made of ? Implant material is made from different types of metallic and bone-like ceramic materials that are compatible with body tissues. Most implants are made of titanium, which bonds well with bone and is biocompatible, making it an ideal material for implants. How are implants placed? First, the dentist will perform surgery to place the implant's anchor in the jaw. it may take as long as six months for the jaw bone to grow around the anchor to hold it firmly in place. Once the implant is stable and the gums have healed, the dentist or specialist makes the artificial teeth and fits them to the post portion of the anchor. 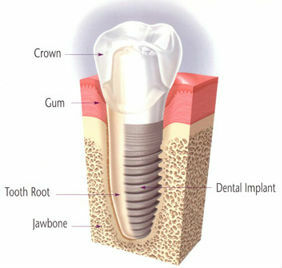 Your dentist will work with you to create an implant that fits well and is comfortable and attractive.